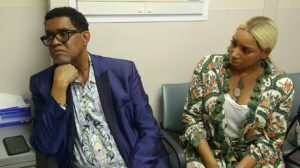 NeNe Leakes Says Gregg Is "Mean, Grouch, & Evil For No Real Reason"
Season 11 of Real Housewives of Atlanta has centered around NeNe Leakes coping with Gregg Leakes’ cancer diagnosis. Gregg has always been the person to bring this cast together. He has been the one RHOA husband whose input is always welcomed by the group. Short story long, Gregg can do no wrong as far as most viewers are concerned, minus that quick divorce. No one has a bad thing to say about Gregg, except for NeNe, apparently. Of course, there are spats in every relationship. However, disagreements just shouldn’t play out on Twitter, especially on very public Twitter accounts. NeNe really should have saved this rant for a group text with girls or some angry messages to Gregg himself. NeNe began, “I would just think if I have or had cancer, I would see life so differently! Not being mean, grouchy and evil for no real reason! But that’s me. Pray for me.” Of course, she can’t add all of the context to a single tweet, but that’s quite the damning tweet. Was this all a publicity stunt? Or is the sudden production of these mugs merely a coincidence? 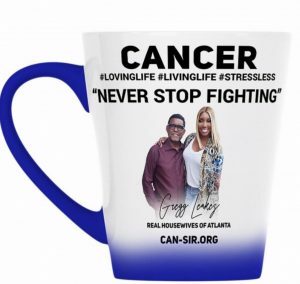 Either way, proceeds from the mugs do benefit American Cancer Society. Now, I’m just dying to know what set NeNe off in the first place and what happened after she posted all of those tweets. TELL US- WHAT DO YOU THINK ABOUT NENE LEAKES’ TWITTER RANT? HOW DO YOU FEEL ABOUT GREGG LEAKES’ INSTAGRAM RESPONSE? WHAT DO YOU THINK ABOUT THE MUGS?